The 60-issue Vertigo series has been picked up by cable's WGN America. Back in 2007 writer-artist team Jason Aaron and R.M. GuÃ©ra brought their fictional Prairie Rose Indian Reservation to life, and peopled it with any number of crooks, sinners, dodgy politicians and one crime-fighting undercover F.B.I. agent: series hero Dashiell Bad Horse. It enjoyed a 60 issue run and the love of its hard-core fans, and now it's about to go one step further, onto the small screen. Cable network WGN America has picked up the Vertigo series, with Doug Jung, currently working on small town crime series Banshee, as scriptwriter and producer. "It's not a series that's ever going to sell 100,000 copies a month in the direct market," said writer Aaron when the series was still running. "But it's a book that the people who find it do seem to respond strongly to. I just try to write for myself and please myself." Whether or not everything in the books will get an airing when it's translated to television is an open question; much like John Constantine's cigarettes, there may be elements of Scalped that won't play well with the cable bosses. DC's been busy of late. 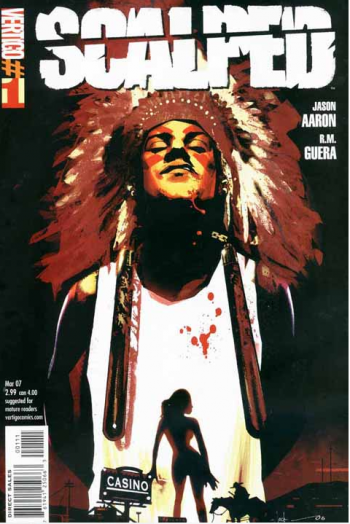 Scalped joins Constantine, iZombie, Hourman, Preacher, and Gotham in its soon-to-be-televised lineup. Development is a relatively new thing for Chicago-based WGN, which until recently didn't have an original series of its own. Here's hoping WGN manages something special with Scalped.